Upon returning from an exploratory mission in space, the Life Foundation’s shuttle crash lands back on Earth. Carlton Drake, owner of the Life Foundation, is frantic to recover alien specimens collected during the expedition. While one specimen escapes, Drake is able to recover the remaining samples and begins testing on human subjects. Drake labels the aliens specimens as symbiotes and seeks to achieve human-alien symbiosis as a means to “save” and advance the human population. Eddie Brock is an investigatory journalist whose life takes a drastic turn after digging too deep into Drake and the Life Foundation. After losing his job and fiancé, Eddie finds himself hopeless and alone. Reluctantly, Eddie continues to investigate the Life Foundation after discovering Drake’s experiments are resulting in multiple human deaths. After breaking into the Life Foundation facility with some assistance, Eddie attempts to release one of the test subjects. Upon opening the subject’s door, he is attacked and bonds with one of the symbiotes. The symbiote reveals itself as Venom and informs Eddie about the impending invasion and destruction of Earth. Eddie evades capture with the help of Venom’s incredible and violent abilities while attempting to release evidence of Drake’s crimes. Drake achieves symbiosis with the symbiote known as Riot and the pair make plans to launch another spaceship and retrieve the massive symbiote horde. The film culminates with a brutal battle between Venom and Riot that will decide the fate of the Earth. As a massive fan of the Venom character, I am happy to say that this film is a drastic improvement from the Venom we were subjected to in Spider-Man 3. Seriously??? Eric Forman as Eddie Brock?!!! Sorry… I still have some unresolved issues with that film. Back to the review! Lets start with the good. The Venom design works well on screen for the most part. I know many fans wanted him to have the white spider on his chest, but that would’ve made no sense as Venom has never bonded with Spider-Man in this universe. I loved that Venom was finally the right size and build. The action sequences were well done and the fight choreography was creative. Another strength of this film is Tom Hardy’s performance as Eddie Brock. Even with inconsistent dialogue, he brought Eddie Brock to life. The saving grace of this film was the relationship between Eddie and Venom. Their interactions were captivating and surprisingly funny. And how could I forget She-Venom?! I was shocked and elated to have that moment from the comics brought to the big screen. Now for what didn’t work so well. The script was inconsistent. At one point, Eddie learned that Venom was causing his heart to atrophy, but at the end of the film they were still bonded together. There was never any clarification that Venom could actually heal Eddie in that way, but we’re just meant to assume he’s ok with the symbiote feeding off of him? Small detail, I know, but kind of important. The cgi at times was a little rough, especially when it came to Eddie using just the tendrils from Venom. Why and how did Riot know he could bond with Drake? Why was there a dramatic scene of Venom dying to protect Eddie to just magically have them back together one scene later? I was excited about the end credit scene reveal of Woody Harrelson as Cletus Kasady, but his line about Carnage was just too on the nose for me. There are a lot of plot holes in this film, but honestly, I had fun. It’s not a great movie by any means, but I laughed and enjoyed myself. 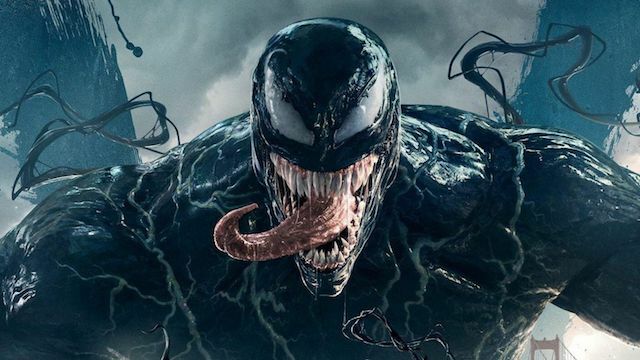 Many Venom fans have vocalized their issues with this film not being rated-R. There’s this idea that Venom can only be done right with extreme violence and gore, but is that true? I watched the animated series and loved Venom in that… not R-rated… I’ve read hundreds of Venom related comics… maybe only a couple would be considered R-rated. But Venom is supposed to eat people with lots of blood flying everywhere! You sure? Venom is hardly ever a cannibal in the comics. He eats people in the Ultimate universe and the Venom from the main universe that became a cannibal was Mac Gargan, not Eddie Brock. Basically what I’m saying is, this movie isn’t going to underperform due to a PG-13 rating. If anything, it’s going to be hurt from poor dialogue and an inconsistent plot. Do I want an R-rated Venom film? Sure I do! But I don’t think it needs an R-rating to be done right. With all that being said, I do hope we get a sequel with Carnage and an improved quality of writing. There are some great Easter eggs hidden throughout the film so I suggest going a second time to see what you missed. Did you catch the last name of the astronaut from the opening scene? How about the name of the legal office on the file from Anne’s computer? Let me know what your favorite Easter eggs were in the comments down below!